The Pokolbin wine region abounds with numerous attractions to complement your Grapemobile Hunter Valley Cycling Adventure. 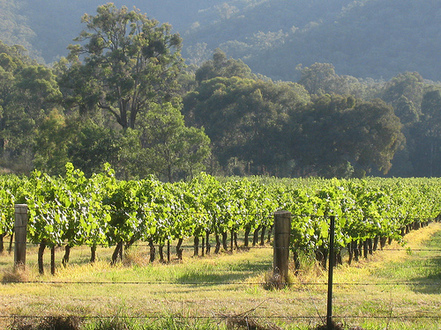 the suggested unique Grapemobile vineyard trails, an excursion in the midst of nature, where kangaroos abound in beautiful surrounds. Experience a real off-road country trail with the unmatched panorama of the ‘vine ride’. Visit a host of luminaries at cellar doors, such as the original Pokolbin Brothers Wines, Scarborough Wines, Vinden Estate, Constable Estate, Waverley Estate, Gemelli Estate, Moorebank Vineyard Estate and Calais Estate Wines. Along the way, enjoy a Gourmet Picnic or Cheese Pack, or dine at the fabulous Verandah Restaurant. Each attraction distinctive, each with a colorful story to share. A treasure of pleasure, right in the heart of Pokolbin! All within easy cycling distance, all part of your ultimate Hunter Valley Cycling Experience! Grapemobile's Hunter Valley Bike Hire .... a must do!